Reliability engineering not only involves the use of statistical tools (e.g., Weibull analysis, degradation analysis, accelerated life testing, system simulation, etc.) but also involves the use of efficient management methods. In this article, we will briefly discuss the history and the role of failure reporting, analysis and corrective action system (FRACAS) in a reliability program, and introduce ReliaSoft's XFRACAS. This web-based FRACAS tool provides an organization wide platform that connects together all reliability-related management and analysis activities. With the advancement of computer technology, FRACAS has evolved from a paper-based single-person tool to a web-based multiple-user system. It is also no longer limited to simple failure reporting, analysis and correction, because formal management methods such as DMAIC and 8D approaches can be successfully integrated into FRACAS. For example, the following figure shows a DMAIC process as implemented by ReliaSoft’s XFRACAS software tool. The figure shows the Problem page, which provides a flexible framework for team-based problem resolution. 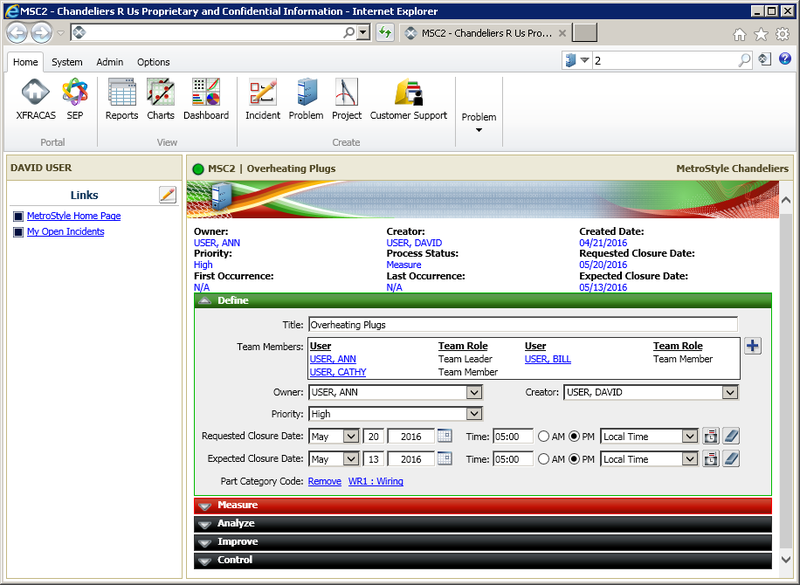 With this approach, you can assign multiple incident reports to a single problem. This enables you to resolve the underlying issue, which addresses all related incidents and improves the design and/or process to prevent similar issues from occurring in the future. The Problem page can be customized to support any problem resolution methodology. XFRACAS can also be configured to capture the details of failure analysis investigations. This gives a complete record of your organization's response to a particular failure. ReliaSoft's Weibull++ and RGA software applications are integrated with XFRACAS, enabling you to easily use the failure data to perform reliability analysis. In this article, we discussed the benefits of the closed-loop incident resolution process of FRACAS. Using ReliaSoft’s XFRACAS tool, you can set up a formal process for reporting, analyzing and resolving reliability-related issues during the product life cycle.